Henry Slade said England's game-plan had been put into "perfect" operation after his two tries helped secure an upset 32-20 victory away to champions Ireland in their Six Nations opener on Saturday. The Exeter Chiefs star, who was joined on the field by club-mates Jack Nowell, Luke Cowan-Dickie and Harry Williams, was full of praise for the England performance which also included a try bonus point following further efforts from Jonny May and Elliot Daly, while skipper Owen Farrell kicked the remainder of his side's points at the Aviva Stadium. Ireland countered with tries of their own through Cian Healy and John Cooney, both of which were converted by fly-half Jonny Sexton, who also added two penalties. However, it was not enough for the defending champions who were well beaten on the day. "It's a great feeling coming over here and getting a win. We dug in today. We had a lot of defending to do. We've put in a big shift over the last couple of weeks in camp," he said of England's preparations in Portugal. "We knew exactly how we wanted to play and we executed it perfectly. The half-backs (Ben Youngs and captain Owen Farrell) controlled the game well and everyone put themselves on the line." But Slade also formed an effective partnership with Manu Tuilagi. "It's the first time I've ever had the chance to play with Manu," said Slade. "I really enjoyed playing with him and who knows, maybe we can carry on." England and Ireland were playing their first international of a 2019 that culminates with the World Cup in Japan. And for those seeking omens, this was the most points Ireland have conceded in a Six Nations match at home since England won 42-6 in Dublin -- the year that England won the World Cup. England coach Eddie Jones, in charge of the Australia side that lost the 2003 final, was delighted with Saturday's success. "We had a good preparation, the guys came together really well and we had a good base from the autumn," Jones said. 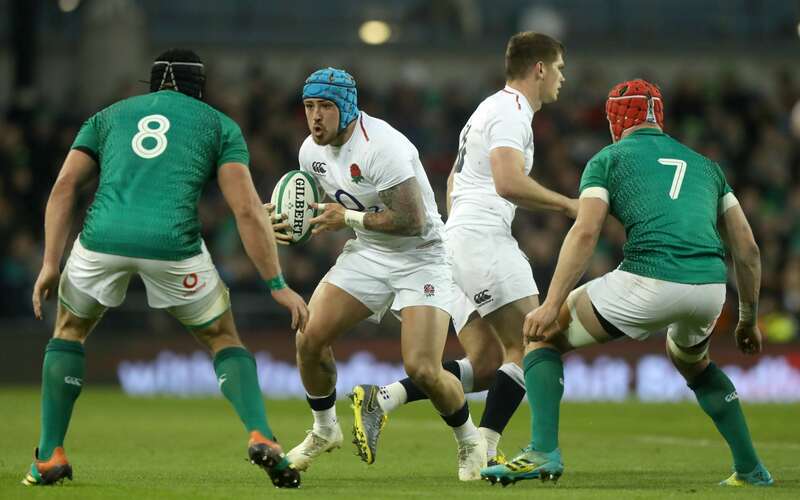 England won three out of four Tests in November and only lost narrowly to world champions New Zealand. Both Slade and England fullback Elliot Daly had faced questions about how they would perform under pressure against an Ireland side second to the All Blacks in the world rankings. But former Australia and Japan coach Jones said: "They are both good players and I have not seen a back that doesn't make mistake. We wanted them to try things and I thought both were outstanding. We want to play good England rugby and that involves attacking kicks. We want to exploit space in behind and I think that is what we did." Ireland coach Joe Schmidt said his side had been "beaten up" in what he called "my most disappointing defeat at the Aviva". "We got beaten up – similar to what happened two years ago when we lost to New Zealand," Schmidt, whose side ended 2018 by beating the All Blacks. "We didn't hit the ground running," said the New Zealander, who is overseeing his last Six Nations as Ireland coach before standing down after the World Cup. We tend to get better going through the Championship and a massive challenge for us now is to get better, fast. Schmidt praised England, saying: "Their kicking game was really strong - tactically it is normally a strength of ours but they did their homework and denied us access. We couldn't get any possession on the back of that. We struggled."